MONTPELIER, Vt. (AP) — Lake Champlain’s population of prehistoric-looking lake sturgeon that can live up to a century, grow to 8-feet long and weigh 300 pounds appears to be improving, but the species still needs protection to ensure its recovery, said a Vermont biologist who studies the fish. Sturgeon are easier to find in the lake than they were a few years ago and more anglers are inadvertently catching them, including during the winter, Chet Mackenzie, a state fish and wildlife biologist said Tuesday. He added that individual fish that are being studied are showing fewer wounds from parasitic lamprey, fish that feed by sucking the blood of other fish. 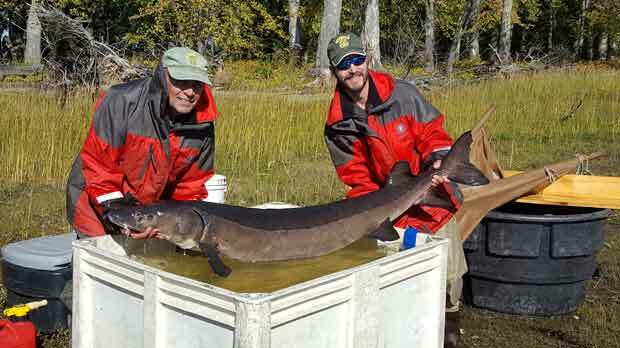 “I am pretty much able to go out any time and catch lake sturgeon,” said Mackenzie, noting they are usually found in four lake tributaries, the Missisquoi, Lamoille and Winooski rivers and the Otter Creek. Over the last century their populations plunged around the country due to habitat loss, including dam construction, overfishing and pollution. The population of lake sturgeon is estimated to be 1 percent of what it was a century ago. While there is some good news, biologists still do not have a firm estimate of the Lake Champlain sturgeon population, and a recovery plan released in 2016 estimated it could be half a century or longer before the population reaches the level where they could be fished. The news about the Vermont sturgeon population came the day after the environmental group the Center for Biological Diversity asked the U.S. Fish and Wildlife Service to list the lake sturgeon as threatened under the Endangered Species Act. Failing that, the center asked the service to determine if there are distinct populations of sturgeon that warrant separate listing. Historically, lake sturgeon could be found in the waters of 23 states around the Great Lakes, the Mississippi River, and in the St. Lawrence River basin, which includes Lake Champlain. The fish along the eastern edge of the range, including Lake Champlain, appear to be doing better than the sturgeon in parts of the Great Lakes or along the Mississippi River, said center spokesman Jeff Miller. Sturgeon are listed as endangered under Vermont law. Mackenzie said he had no opinion on the request by the Center for Biological Diversity to seek protection for sturgeon.